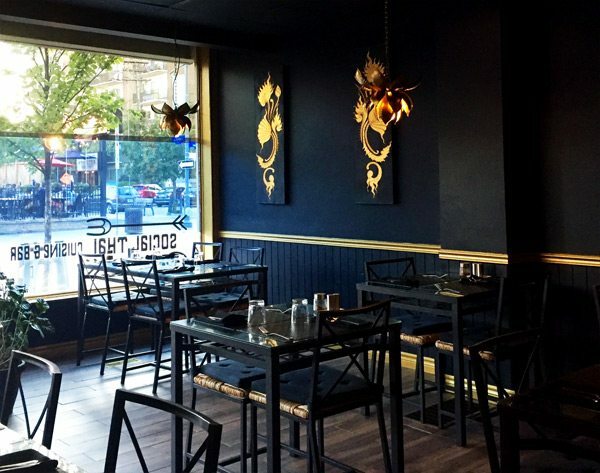 Blacks and golds deliver some elegant glitz, the lighting is subdued, and the reluctance to overdo the clichés of Thai décor is welcome. 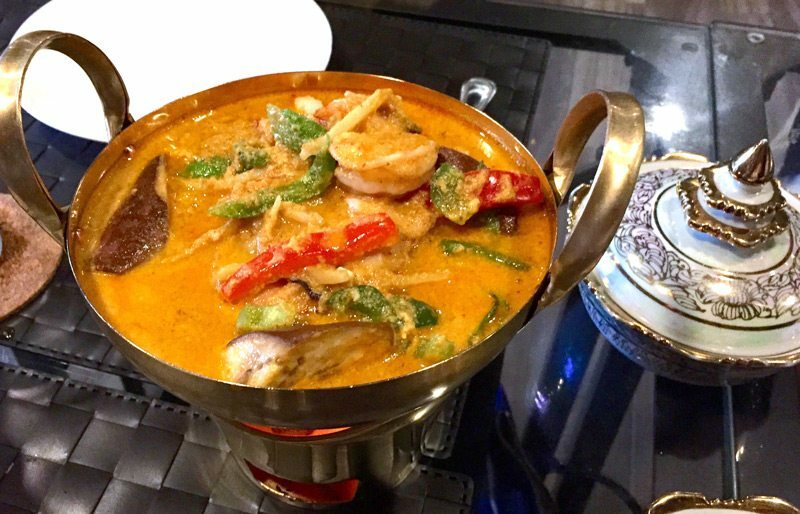 The signature curry is a well done classic with seafood, yardlong beans, Asian eggplant and peppers, reddened with curry paste, smoothed with coconut milk, and fragrant with plenty of Thai basil. 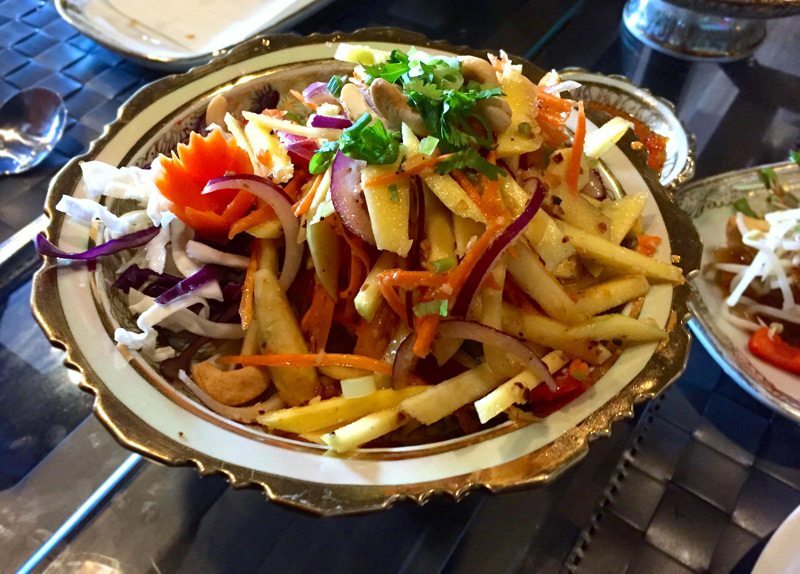 A piquant nest of shredded mango, red onion and julienne vegetables, with toasted rice powder, chopped mint and roasted cashews, delivers on every front except for the incendiary heat we expect from a classic Thai salad. Quite possibly our error: it was later in the evening I notice the menu’s sidebar option to ramp up or down the chile heat of a dish. A piquant nest of shredded mango, red onion and julienne vegetables, with toasted rice powder, chopped mint and roasted cashews, just be sure to ask if you want it spicy. In fact, we found none of the food at Social Thai particularly combustible. The default seems to be mild. But I understand completely a restaurant’s interest — particularly a restaurant that caters more to a downtown lunch crowd — to keep the pow factor to a minimum. If you want to stoke the fire, ask. 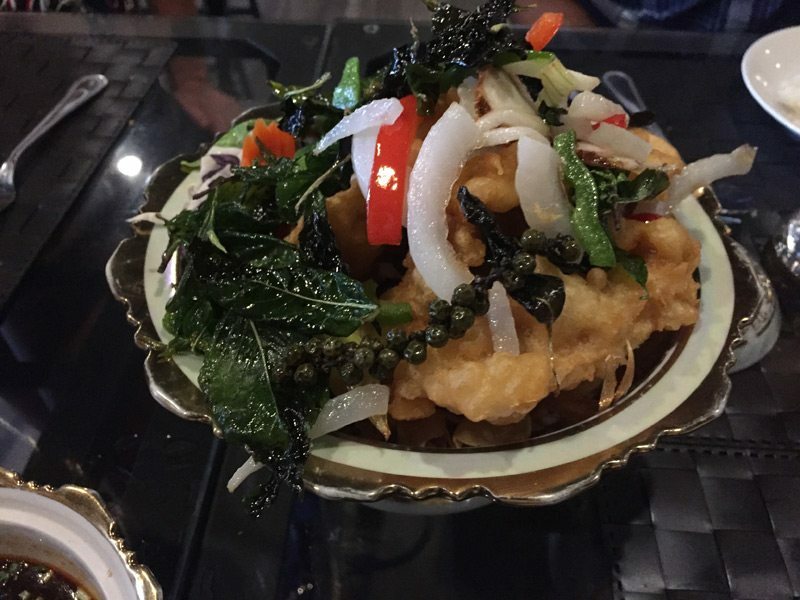 The fried tilapia dish is almost too pretty to eat, with the crunchy fish loaded down with onion, glistening peppers, flash-fried basil leaves and stems of green peppercorns, but you’ll be glad you dug in.